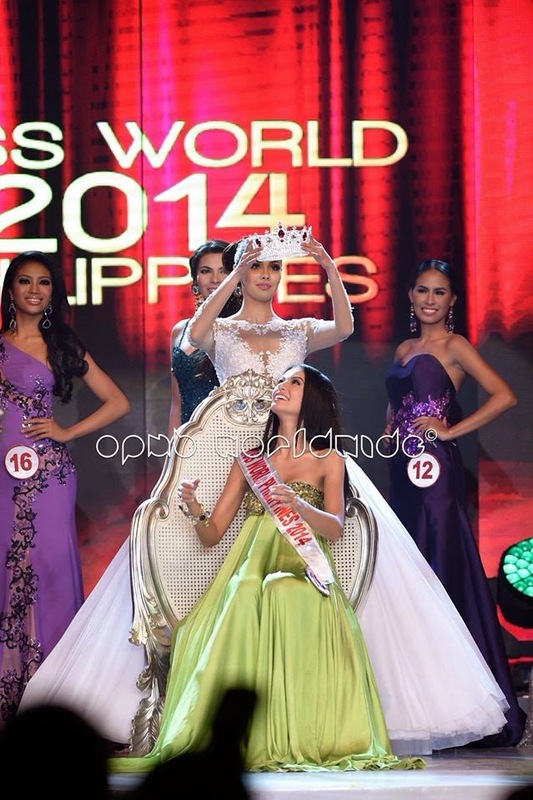 Valerie Weigmann was crowned Miss World Philippines 2014 at the coronation night held at SM MOA Arena in Pasay City on October 12, 2014. There were 26 candidates in all. The following served as judges: Rep. Roman Romulo of Pasig City (Chairman of the Board of Judges)), Marian Rivera (GMA-7 actress), Jesi Mendez (hair salon founder), Jasper Evangelista (Solaire VP for Brand and Marketing), Nancy Go (Bluewater Day Spa), Cristalle Belo (Belo Medical Group managing director), Bryan Lim (Suyen Corporation VP for Business Development), Amb. Thomas Assowski (German ambassador to the Philippines), Anette Gozon-Abrogar (GMA Films executive) and MMDA Chairman Francis Tolentino. The Top 5 received the following cash prizes: Miss World Philippines 2014: P1 million; 1st Princess: P250,000; 2nd Princess: P200,000; 3rd Princess: P150,000; and 4th Princess: P100,000. For the complete list of 26 candidates, click here.